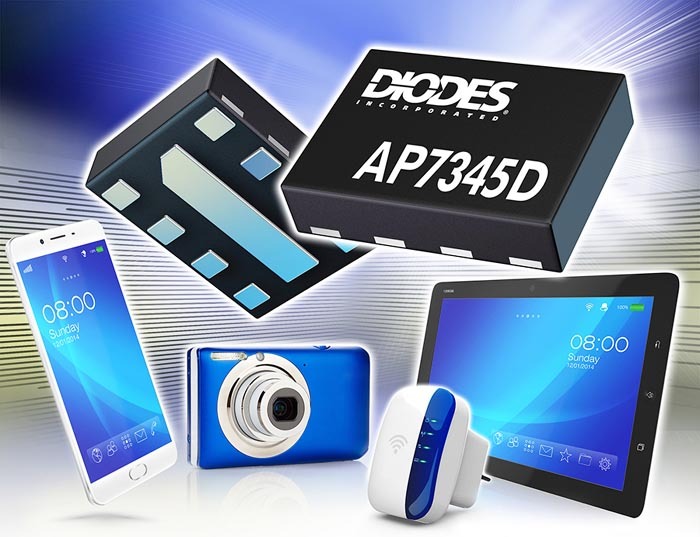 Diodes Incorporated announced the AP7345D family of dual low-dropout (LDO) voltage regulators that offer high power supply rejection ratio (PSRR) and low quiescent current, making them suitable for applications powered by primary cells such as AA or AAA batteries. The AP7345D offers independent voltage input with an enable pin for controlling the output. This provides for more flexibility when designing the power source for applications. Each channel switches off or on within approximately 10 µs of the EN pin changing state, while the EN pin on each channel can also be tied high if output control is not required. The AP7345D family features an excellent PSRR of 75 dB at 1 kHz, across the full output voltage range. The input voltage range extends from 1.7 V to 5.25 V and each of the two channels can deliver up to 300 mA, guaranteed. The inclusion of short-circuit protection ensures the LDO does not sustain damage in the event of a short circuit on either of the output voltage rails. The family comprises 22 devices covering a range of fixed dual-input/dual-output voltages between 1.2 V and 3.6 V, with an accuracy of ±1%. With such a comprehensive range, the AP7345D family can address a wide variety of battery-powered applications. The addition of an LDO enables more of the primary cells’ voltage to be used, extending the useful lifetime between battery changes. In addition, choosing an LDO with high PSRR ensures a steady and regulated supply voltage to sensitive integrated circuits. The AP7345D is packaged in X2-DFN1612-8 package, providing a small PCB footprint to enable high levels of power density.